Many people turn to nature to seek refuge from life’s problems. I think we sometimes forget that we are part of the natural world. When we deny ourselves exposure and confine ourselves in our homes or offices in front of screens we can become out of sync. One can learn so much about life by just going out into nature and exploring its infinite grace and beauty. Nature is both revealing and healing. Juried Exhibition sponsored by the Art League of Germantown titled "Companions"
My print “And So On...” is lovingly dedicated to my mother Marie who passed away in December 2017. She was a wonderful mother to seven children. 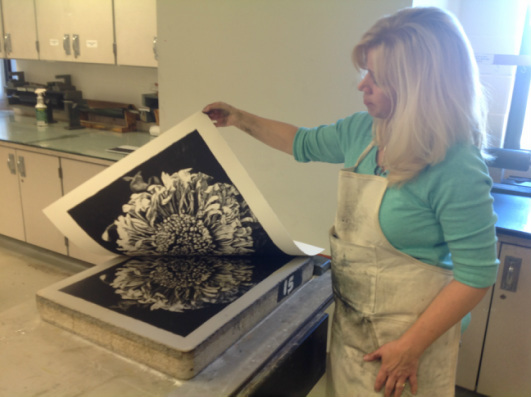 This print was inspired by the center of a Clematis flower. They are glorious perennial flowers that bloom in my yard each spring. This print not only celebrates the miracle of the cycle of life, but also serves as a comforting reminder that life continues long after we leave this world. Awarded an Honorable Mention at the Strathmore's 27th Annual Juried Exhibition titled "Poe and Puck"
While I was in the process of etching this print a call for entries came from The Strathmore in Rockville, MD for their “Poe and Puck” exhibit. What came to mind was Edgar Allen Poe’s Raven that whispered “Nevermore” to dash one man’s dream of love. The message is clear, don’t let anything or anyone get in the way of your dreams! 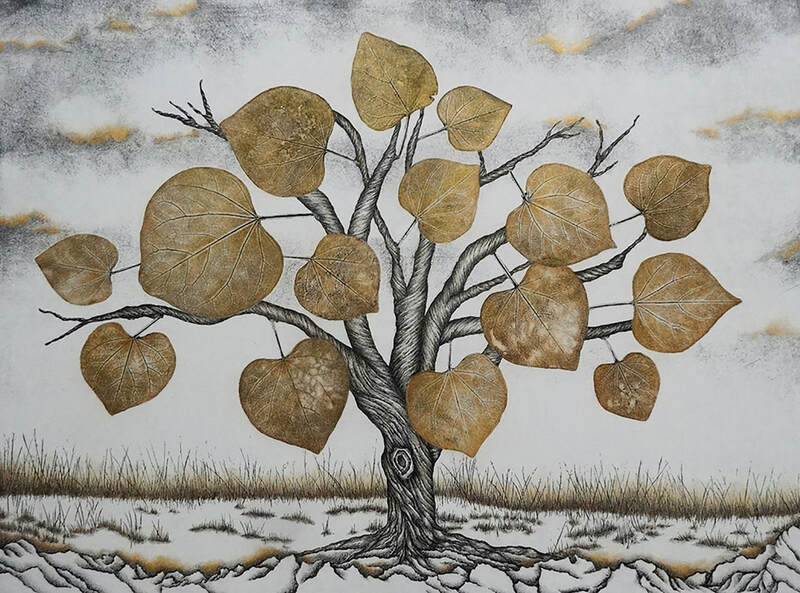 On Exhibit February 23 - April 2, 2018 in the Arts Barn juried exhibition tiled "The Art of Print"
“Winter’s Gold” was inspired by an Eastern Redbud tree that I encountered while hiking on Sugarloaf Mountain one winter’s day. I saw an isolated tree against the snow with golden leaves that never fell off during the fall. The leaves seemed too big for the tree’s branches. I created 14 plates using actual leaves from an Eastern Redbud and layered them onto a larger plate to create this print. In the future I will use these sculpted leaf plates to elaborate about this very interesting and productive tree. Pulling my first print off of the stone! I have been enjoying my new explorations in Lithography! Visit my Gallery for more details.